The structural diversity of spiro heterocycles has achieved an extensive attention of organic chemists due to their vast synthetic applications. Among these, spiropyrazolines are gaining considerable prominence due to their biological and pharmacological activities, electrophotographic photosensitivity as well as their application as beneficial synthons for spirocyclopropanes, cyclobutanes, pyrrolidinones, pyrazoles, 3-amino oxindoles and several natural products molecular architecture. 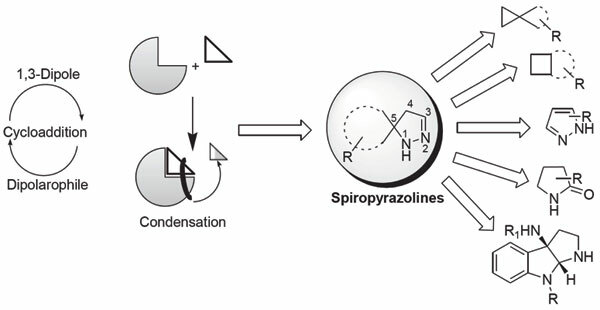 In view of all these, this review aims to provide the classical and advanced regioselective approaches as well as synthetic applications of spiropyrazolines. The key reactions for its synthesis are 1,3-dipolar cycloaddition and condensations that are described completely in this piece of work. Spiropyrazolines, dipolar cycloaddition, condensation, regiospecific, synthetic applications, heterocycle.